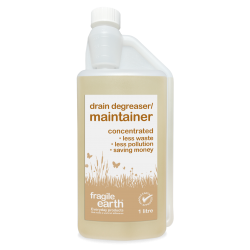 Our drain products eliminate fats, oils and grease in drainage systems. They are all based on the same biological action using enzymes and bacteria to digest waste build up and remove malodorous, putrid and fetid contents converting them into harmless products. Unlike chemical enzyme alternatives, which act by putting grease into solution and moving the problem downstream. Fragile Earth products work differently by combating fats, oils and grease on two fronts. 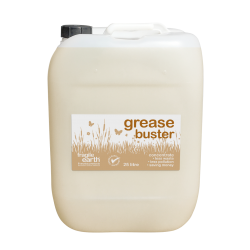 Where many ‘solutions’ either have bacterial or enzyme treatment, Grease Buster employs the power of both. Bacteria on their own take time to digest the greases, and enzymes on their own only break down and move the problem, rather than removing the source. Fragile earth's advanced natural enzymes, break down the fatty chains (including fats, oils, grease, and biological matter) into manageable bite-size pieces, which then become a food source for the bacteria which they rapidly digest into carbon dioxide, oxygen and water keeping drains and grease traps free flowing. Our advanced bacterial formulation has a residual effect lining the treated surfaces with a ‘Biofilm’. 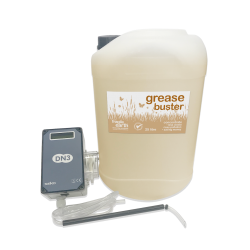 The ‘Biofilm’ continues to protect, repel and digest grease up to 16 hours after dosing. The success of our products is based on the high quality and concentration of the bacteria used in comparison to competitive products. Our bacteria are cultured in advanced laboratories and freeze-dried as opposed to the more common spray dried process normally used. This ensures that no contamination and degradation of the product occurs. Our natural bacterial products are an extremely effective solution to odour control as they contain specialist aerobic and anaerobic microorganisms, which digest the odour causing bacteria, by effectively cannibalising them, permanently removing the problem.